If you want breastfeeding to go smoothly, you might want to ask the hospital to delay that first bath for your newborn, new research suggests. For decades, it’s been standard procedure to give newborns a bath within the first few hours after birth, but the new finding suggests that waiting 12 or more hours before doing so may promote breastfeeding. The study included nearly 1,000 mother-newborn pairs. Just under half of the newborns had their first bath shortly after birth, while that bath was delayed for just over half of the newborns. Rates of exclusive breastfeeding during their hospital stay were 59.8 percent for newborns in the typical bath group and 68.2 percent in the delayed bath group, the researchers found. Newborns in the delayed-bath group were also more likely to have a hospital discharge feeding plan that was exclusively, or at least included, breast milk. A number of factors may explain why delaying a newborn’s first bath may improve breastfeeding rates, said study leader Heather DiCioccio. She’s a nursing professional development specialist in the mother/baby unit at Cleveland Clinic’s Hillcrest Hospital. 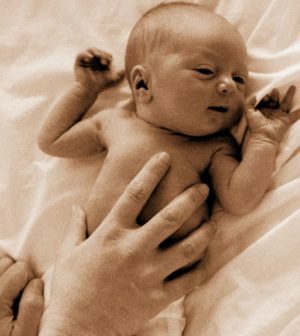 Delaying the first bath provides more initial skin-to-skin time between mother and baby, and preserves smell, which is important because the similarity in smell between the amniotic fluid and the breast may encourage babies to latch, the study authors said. The investigators also found that newborns in the delayed-bath group were more likely to have stable/normalized temperatures after their first bath. “They weren’t as cold as the babies who were bathed sooner after birth, so they may not have been as tired trying to nurse,” DiCioccio explained in a clinic news release. “It is now our policy to delay the bath at least 12 hours, unless the mom refuses to wait. In that case, we ask for two hours,” she said. The Cleveland Clinic is taking steps to implement delayed newborn bathing in all of its hospitals, and DiCioccio hopes that with further research, this will eventually occur nationwide. The study was published Jan. 21 in the Journal of Obstetric, Gynecologic, and Neonatal Nursing. The American Academy of Pediatrics recommends exclusive breastfeeding for about 6 months, and then continuing breastfeeding while introducing foods until a child is 12 months old.